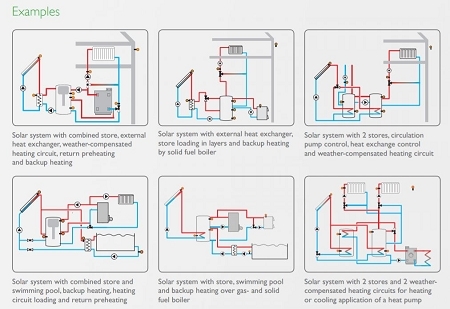 The RESOL Delta Sol® MX is a system controller offering almost endless possibilities in configuration and controlling of any solar thermal and hydronic heating/cooling systems. It is equipped with 14 relay outputs and 4 PWM outputs for the speed control of ECM pumps. Additionally, the controller has three impulse inputs as well as a range of different sensor inputs. 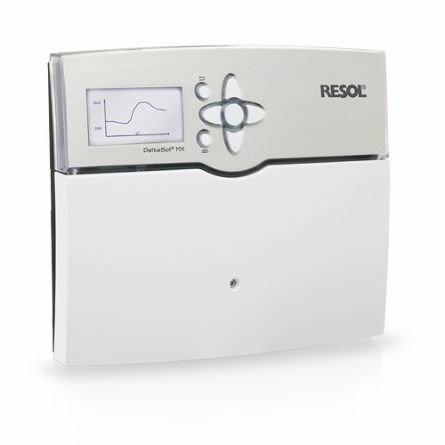 Up to 5 EM Extension modules can be connected via the RESOL vBus®. The integrated SD memory card slot enables an easy datalogging to an SD memory card and a quick, effortless transfer of logged data to a PC. The DeltaSol® MX controller is c LCus certified and meets the demands of the UL 60730-1:2009 and CSA B60730.1:2002 standards. Dimensions: 253 x 200 x 47 mm / 10.1" × 7.9" × 1.7"